Yesterday we previewed the Bing Halloween page, and today it’s Google’s turn. We all know Big G has a long history of playful doodles for the big holidays, as well as more obscure events. So let’s see what we have here. Rather than a static image, this one takes a little skill. There actually is a real-life cat named Momo, which belongs to Google Doodler Juliana Chen. 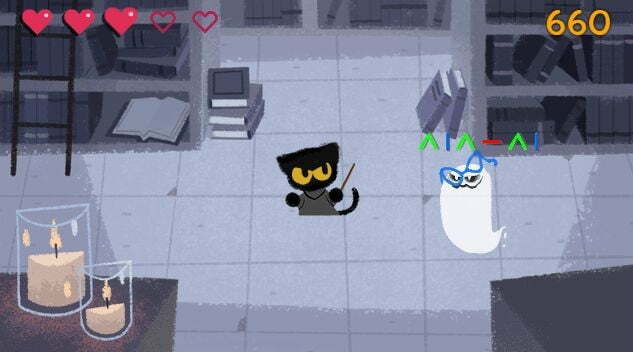 Google said that the video was originally going to be about a cat making soup, before it morphed into its final incarnation with wizards (perhaps with a bit of a Harry Potter vibe). The game has five levels set in a school setting: the library, cafeteria, classroom, gym, and the building’s rooftop. 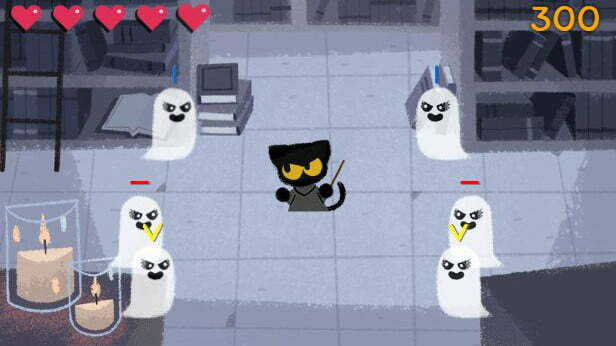 As you move through the game, the ghosts appear on the screen with simple symbols. 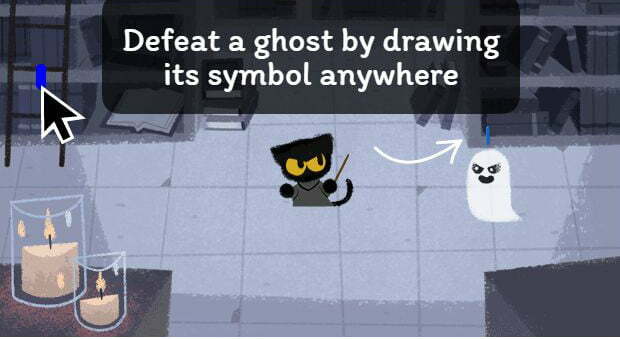 The Verge mentions the symbols as “A V and inverted V, horizontal and vertical lines, and lightning bolts.” As each level progresses, it gets harder to make the ghosts disappear! It’s easy when one malevolent Casper floats in with a small line above his/her head. But when they all gang up on you, it gets a bit tricky. And when your neck is on the line, how the heck are you supposed to type all those symbols when your adrenaline is pumping? A total of fourteen Doodlers had a hand in creating this year’s effort, along with a team of five black cats — Momo, Ripley, Nimbus, Harley, and Baxter.